Was born 1961 in Rostov-on-Don, Russia. He studied with Peter Keller in the art Studio "Rostselmash". He studied at the art college named after M. B. Grekov. He graduated from the Pedagogical Institute, Graphic arts department. The artist worked at the plant trade advertising for the post of the artist-designer. There he mastered all kinds of monumental and decoration art. This gave him chance to use in his work different materials and techniques. He worked as an artist in the cinema "Rostov". Abramov Mikhail became known, thanks to its advertising posters for films. His posters-it has always been an idea, provocation, creativity. 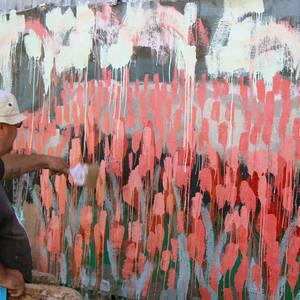 Since 1982 he has been engaged in creative and exhibition activities. Mikhail Abramov pays great attention to composition and color. His colors are complex and laconic. His compositions are monumental. He does not copy the real world. His compositions are fragments or symbols of the vast universe, which go far outside of the picture. Mikhail is participant nonconformist currents of fine arts in the 80s. He is an active participant of the international exhibition project in Germany "Die Russen kommen". One of the organizers of the gallery of contemporary art "March" and ”New Russian gallery”. The artist currently lives and works in Rostov-on-Don.